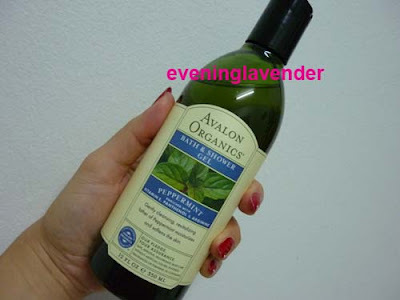 I bought this Avalon Organics Peppermint bath & shower gel a while ago and it was left sitting on the shelf for quite sometime before I start using it recently. Nourishing botanicals, gentle cleanses and the invigorating aroma of organically grown Peppermint replenish your skin and revitalize the senses. peppermint leaf oil, candelula flower and chamomile flower extracts, bisabolol, arganine (amino acid), pro-vitamin B5 and Vitamin E.
1. First of all it is an organic product with NO parabens, NO synthetic fragrances, NO SLS/SLES or aritificial colors (it is actually colorless). This shower gel can really freshen the body up after a hot day. I love to use it on sunny days. Have you tried this product before? I absolutely LOVE everything organic!!! !